Radnor high visibility mechanics gloves offer a gray suede palm covered PVC grip patches on the palm and fingers and KEVLAR material reinforcing the thumb crotch for extended wear. Padded palm reduces stress from impact. The back is flourescent orange with a black Spandex neoprene knuckle pad and brow wipe on the back of thumb. Reflective materials on back of glove enhance visibility. 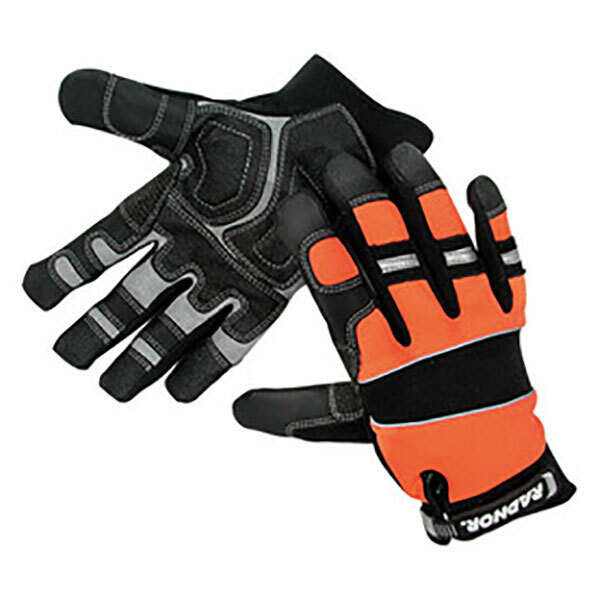 Gloves offer quick close rubber tab with hook and loop closure for comfortable fit.